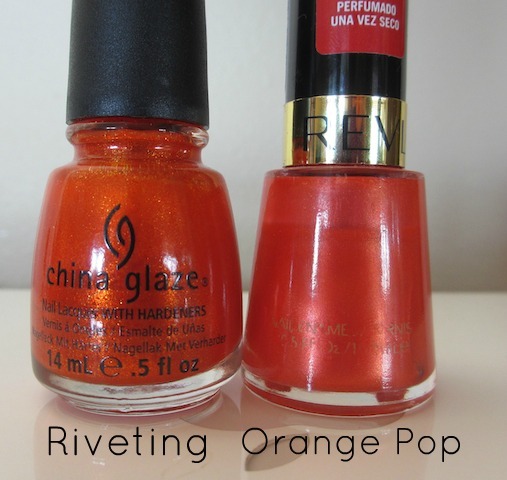 iHeartPrettyPolish: Revlon Orange Pop - ABC Challenge "O"
Revlon Orange Pop - ABC Challenge "O"
I have reached the letter "O" in the Alphabet Challenge. I decided to try Revlon (Scented) Orange Pop! This polish is actually a well loved polish in my stash. 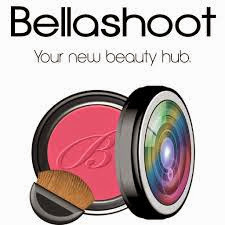 I have used it quite a bit - perhaps it's because it smells so good??? It really does have a yummy orange scent after it dries. Why can't all nail polish smell like this? This is a pretty sheer polish, but it's okay because you can slap on quite a few layers and it never gets too thick - it just glides on layer after layer. This is also a really pretty orange. It's not a cream, but it's not glittery either. Just a bright shiny orange. When I was applying Orange Pop, I was reminded of China Glaze Riveting. I grabbed it for comparison sake and it does look similar, but Riveting has golden shimmer mixed in. Riveting is such a beauty as well. I like Revlon polishes, as well. This one's gorgeous, I can see why it's a favorite! I'm not so into the scented polishes, though; I'd be concerned the fruit scent would distract from my perfume. 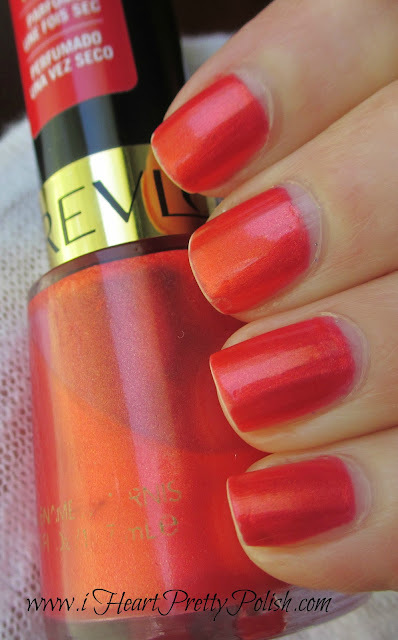 I love Revlon polishes, too! I don't have Orange Pop, though. Very pretty! I love Revlon polishes. They were basically all I used when I first started painting my nails. I LOVE oranges!!! both, color and fruit =) So the scent would just be a bonus for me! I don't really have any Revlon polishes, never really got around to them.. there are soooo many other brands that I'm hogging! I am not usually a fan of orange but this one is really pretty! I do have one scented Revlon and it is in my "get rid of" pile. I just don't like it. Looks great on you!